Epiphanies, like women, can pop up when you least expect them, and they can free you from a troubling part of your life you didn’t recognize as a problem until they were revealed. In a PBS documentary on Mark Twain, a number of incidents arose in the building of Twain’s home, and the construction team began “badgering” Twain with questions regarding how he wanted them handled. The questions regarded the construction of his home, the place he would presumably live for the rest of his life, so the observer should forgive the construction crew’s chief for the badgering. The team didn’t know what he wanted, and there were presumably hundreds of questions they had on his desired specifics. 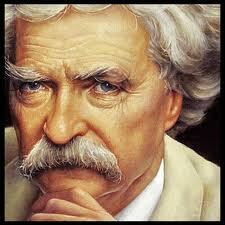 What the team did not know, however, was that Twain had an oft expressed aversion for details. Putting myself in a similar situation, I realize that, like Twain, I’m not a detail-oriented guy. I’ll listen to every question put to me, but I’ll be listening with a sense of guilt. Details make me feel stupid, they start firing far too many neurons in my brain for me to handle, and I usually get overwhelmed and exhausted by them. I know that I should be listening to every question, and I know I should be pondering the details they give me to come up with the ideal solution for my family, but my capacity for such matters is limited. In the beginning of the process, I’m all hopped up. My mind is acutely focused, and I’m knocking out every question with focused answers. I’m considering every perspective involved, and I’m asking for advice from all of those not involved. I’m reading what others have done, and I’m gathering as much information as possible to make an informed decision, but I will eventually grow overwhelmed and exhausted because I’m not a detail oriented guy. By the time we reach the 7th and 8th questions, I’ll be out of gas. I’ll be mentally saying, “Whatever, just get it done!” I’ll be falling away from creative answers and onto what is expected in the situation, or what it is that those still paying attention want. I will be answering in an autonomic manner. “Yes, that sounds fine,” I’ll say without knowing what has been said. I’ll just want the damn thing to be built already by that point, because I’m not a details-oriented guy. I’ll want to make the big decisions, but I’ll want to leave all of the “inconsequential” details-oriented questions to others. I do feel guilty about being this way. I want to be involved, informed, and constantly making acutely focused decisions throughout the process. I’ll feel guilty when others start making the decisions that affect me, because I know I’m an adult now, and I should be making all these decisions. There is also some fear that drives me to constantly pretend that I’m in prime listening mode, based on the fact that I may not like the finished product if I’m not involved in every step. I may not like, for example, the manner in which the west wing juts out on the land and makes the home appear ostentatious, or obtuse, or less pleasing to the eye with various incongruities, and I’ll wish I would not have been so obvious with my “Whatever just do it!” answers. Details exhaust me, though, and they embarrass me when I don’t know the particulars that the other is referencing. I don’t know if this guilt is borne of the fact that I know I’m an intelligent being, and I should be able to make these decisions in a more consistent manner, or if I’m just too lazy to maintain acute focus. I do have a threshold though, and I know how my brain works. I know that if there are seven ways to approach a given situation, I will usually select one that falls in the first two selections offered. I usually do this, because I’m not listening after the second one. Everything beyond that involves the other party showing off the fact that they know more than I do. I know this isn’t always the case, but it’s the only vine I can cling to when having to deal with my limited attention span and the limited arsenal of my brain. Knowing my deficiencies for retaining verbosity, I will ask for literature on the subject that provides the subject a tangible quality that can be consumed at my pace. If I do that, and I have, I will then pretend to read every excruciating word, but I will usually end up selected one of the first two selections offered. I like to think I have a complex brain. I like to think that I display all that I’m about in my own way, but I’m always reminded of the fact that most of the people around me give full participation to the details of life no matter how overwhelming and exhausting they can be to me. It’s humbling to watch these brains, I like to consider inferior, operate on planes of constant choices, and decisions, and retentions, and details I am incapable of retaining. We’ve all heard the line “Everybody’s brain works differently,” but until we learn something regarding the fact that the brilliant brain that composed Huckleberry Finn has similar deficiencies, we cannot help but feel guilty about them. “Well, work on your deficiencies,” those around us suggest, and we do when that next project comes about. We’re out to prove ourselves in that next project. We answer every question, from the first few to the 7th and 8th, with prolonged mental acuity. When that third and fourth project rolls around, however, we’ll revert back to those inferior brains that can’t retain details, and it is then that we’ll envy those “inferior” brains, consistently showing their superiority. This could lead those of us that never knew we were suffering from such a recognized deficiency into feelings of incompletion, until someone like Mark Twain recognizes and vocalizes his defeciencies for us.